Reelected to a fourth term as Susquehanna County Commissioner in 2015, Commissioner Warren says she really enjoys her job. 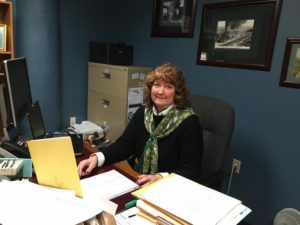 When asked what she enjoys about it, she enthusiastically says, “Helping people!” MaryAnn has accumulated an abundance of resources over her 12 years of service to Susquehanna County and she gets excited when she can point citizens to the right resource for their particular need. She very much appreciates the opportunities placed in her way and takes pleasure from the many challenges these opportunities provide. She has found her work with the Pennsylvania Association of Conservation Districts (PACD) very rewarding. When no one was interested in serving in this area, Commissioner Warren took on the job. She ended up being elected to the PACD state board and served as its president for two and a half years. She says that she started off knowing nothing and learned so much about our county’s natural resources and conservation needs. Ms. Warren is proud of her work with the Leatherstocking Gas Company to provide the availability of gas for local residents. Previously the Courthouse was heated with a combination of coal, oil and electricity. Her perseverance paid off and now the Courthouse, and other residents, are able to take economic advantage of natural gas for their heating and cooking needs. When asked how she gets along being the minority party commissioner, she says that the commissioners must “agree to disagree” on some issues. She, along with her colleagues, must recognize that they are paid to work for the good of the county and the county’s residence and so they must work together. She says her sense of humor helps too, her willingness to listen and her resolve to follow through and get for the county what she feels is important. Recently Commissioner Warren has been working diligently with the Lackawanna Susquehanna Behavioral Health/Intellectual Disabilities/Early Intervention (BHIDEI) program to address the issue of suicides in our county. This problem came to her attention and she has taken it on with gusto. She has been researching available county resources and has gotten together with the appropriate agencies to develop a plan to prevent future suicides from happening. The results of the findings on the problem of suicide and the availability of resources to address the problem has resulted in a plan that was presented at a recent commissioner’s meeting. Commissioner Warren has a reputation among her fellow commissioners, past and present, of being the “go-to Commissioner.” This is a good thing and along with her ability to work with others who may or may not agree with her, allows her hard work for our county to pay off with big rewards.